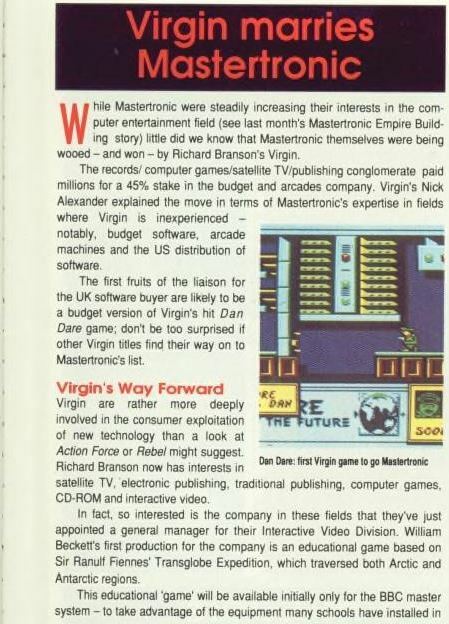 Virgin bought a 45% stake in Mastertronic in the summer of 1987. It seemed to take a long time for some to get the news. This was how ACE reported it in January 1988. The article also had a feature about the 'interactive video' division. This was nothing to do with Mastertronic but when we moved in to Virgin Games' premises in the summer of 1988 they were still working on the arctic exploration game and I have a feeling it never got finished. Reliance on the BBC computer was a very bad idea.